On Sunday, January 7, 2018, Ain Sefra, a desert town in Algeria known as the "Gateway to the Sahara," experienced a substantial amount of snow for reportedly the third time in 40 years. (CNN) - It's quite a time for weird weather, and it doesn't get much weirder than snow falling in one of the hottest places in the world. 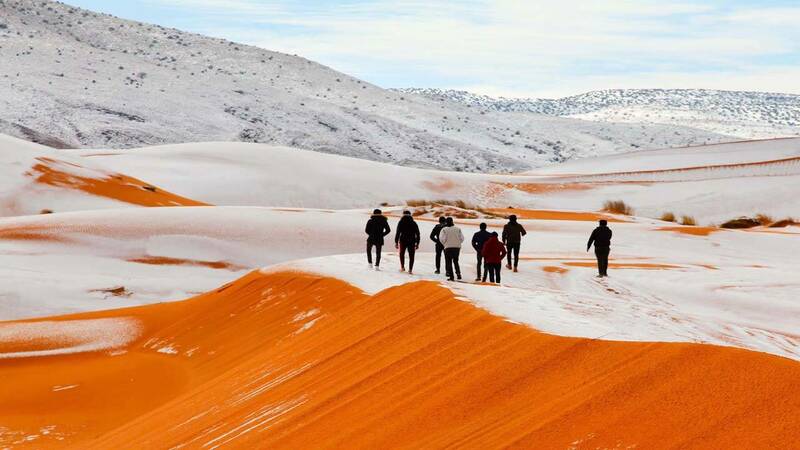 On Sunday, Ain Sefra, a desert town in Algeria known as the "Gateway to the Sahara," experienced a substantial amount of snow for reportedly the third time in 40 years. Some reports say parts of the area got nearly 15 inches of snow, but Ain Sefra officially reported less than one inch. It was enough to provide some otherworldly visuals from an area that routinely sees some of the hottest temperatures on earth during the summer. Now, it's not uncommon for the temperature across even the hottest of deserts to plunge tens of degrees Farenheit at night, meaning any unusual snow could stick around for a while. But photographers at the scene said the snow actually stayed intact for a good portion of the day. "We were really surprised when we woke up to see snow again," photographer Karim Bouchetata told Shutterstock. "It stayed all day on Sunday and began melting at around 5 p.m."
While snow is historically scant in the desert area, a similar snow phenomenon happened just last year. Before that, it had been 37 years since Ain Sefra's last snowfall.